This challenge features calming colors to inspire you — Smooth White, Chili Powder, Cement Gray, and Gravel Gray. 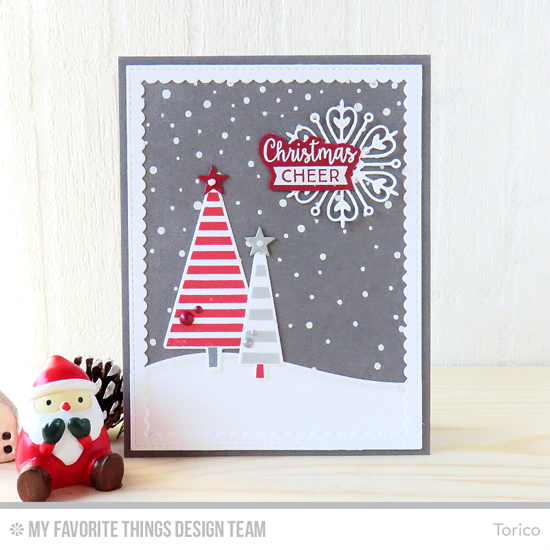 The whimsical striped trees in our Oh Christmas Trees stamp set make for a delightful holiday greeting when paired with snowy accents. Torico's take on this color combination is über chic, don't you agree? Two adorable creatures from the Snuggle Bunnies stamp set share the spotlight on this sweet card from Vika. The bold friend in Chili Powder looks super set against all of that white. 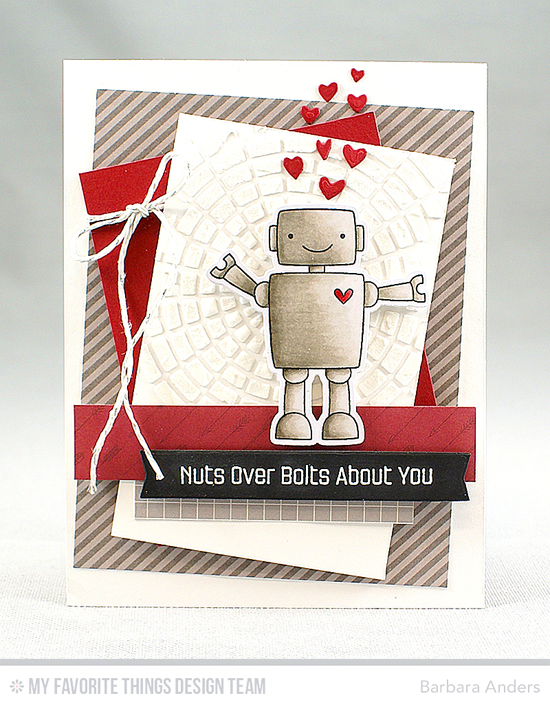 Barbara adds lots of detail and texture behind her Bionic Bot with patterned papers that coordinate with Color Challenge 57 and the Concentric Circle Grid stencil. I love the jaunty nature of this design! Our Cover-Up Die-namics are always a great way to feature several colors. Jodi used the Striped Sentiment Strip Cover-Up to create a cool striped background for her cutie pie kitties from the Cat-itude stamp set. Congratulations, Ratucos de Scrap! You are the randomly selected winner of the MFT Color Challenge. You can view all the entries from the last challenge HERE. You have until Wednesday, November 23rd, at noon EST to add your link and be eligible for the prize of up to $20 in MFT Cash. Winners are chosen at random, so everyone has a chance! The prize is a $15 Gift Voucher to My Favorite Things, but if you use MFT stamps and/or dies in your project, you’ll receive an extra $5. OH be still, my GREY LOVING heart!!! Count me IN!! !